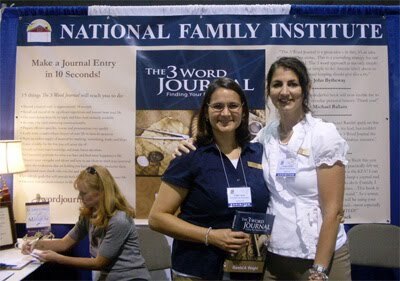 National Family Institute is a newcomer to the convention. They were fun to talk to and had some great items for sale. Including The 3 Word Journal by Randal A. Wright (pictured above). Interesting concept for “non” writers who want to keep a journal. They also had a planner for women from The Success Choice, which I thought looked great for moms. And they had these darling bronzes. Called “Moments of Life” they are sculpted by Mary Adams. She does not a have a website but can be reached by email: mothera [at] gmail [dot] com. 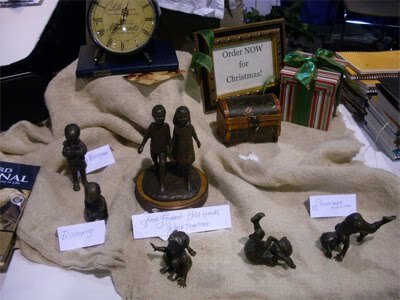 The bronzes are made by the mom of one of the 3 Word Journal gals. The bronzes are Moments of Life and are quite captivating. They caught my eye and I fell in love with them. Now I just have to save up so I can get them. I'm Jen, the gal on the right in the white. The 3 Word Journal is amazing. It's very fun to see how many memories you can capture in just a few moments with this system. We're looking at doing the bronze sculptures in a resin or in a bronze cold press process so that the price can come down. They are wonderful to have!